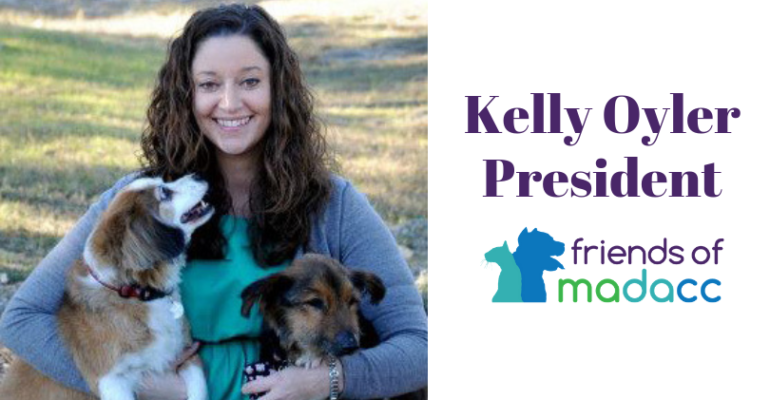 Milwaukee, WI (April 17, 2019) – Friends of Milwaukee Area Domestic Animal Control Commission (MADACC) announced today that its Board of Directors has appointed Kelly Oyler as the new President effective February 20, 2019. Oyler previously held the position of Outreach Director for Friends of MADACC since 2016. Since joining the board, Oyler has doubled the amount of neighborhood shot clinics offered by Friends of MADACC, has integrated the “Pets for Life” philosophy into the organization’s culture and has worked to significantly increase the number of surgeries performed through the Friends of MADACC free spay & neuter program. Oyler began her journey in animal welfare nearly 20 years ago and in that time has volunteered for the Dane County Humane Society, San Diego Humane Society, Petco Foundation, San Antonio Animal Care Services, San Antonio Pets Alive, Animal Defense League and Milwaukee Area Domestic Animal Control Commission. Additionally, Oyler is currently the Senior Manager of Insurable Risk for Walgreens Boots Alliance (WBA), a global Fortune 20 Company. Oyler’s responsibility as the leader of the WBA U.S. Insurable Risk function includes overseeing all first party and third-party claims and lawsuits nationwide, as well as leading the risk management and insurance corporate strategy development and execution. With the most recent changes in leadership, the Friends of MADACC Board of Directors consists of Oyler; Alison Tweddell, Treasurer; Kerry Hoey, Secretary; Cassidy Davis, Marketing; Jackie Wells, Fundraising; Jessica Rasmussen, Fundraising; Kelsey Burazin, Volunteering; and Lauren Dewey, Merchandising. Meghan Marciniak, Fundraising, will be leaving the organization at the end of April. Friends of MADACC is currently searching for additional talent in marketing, volunteering, finance/accounting and outreach. Learn more.